Oprah comes on at 4:00 in my neck of the woods, but many of you have probably already seen Rachael Ray's appearance today. Either way, there is some great stuff on Oprah's website about the appearance, including all the recipes that Rachael Ray prepared (most of which were appetizers) and a slideshow that includes pictures of the dishes Rachael made. There are 11(!) 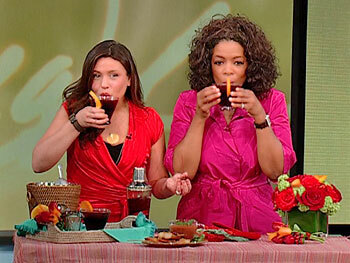 Rachael Ray recipes there and one from Oprah for her Legends Lemon Drop Martini. The recipes that look interesting to me are the Feta Dip with Cucumber and Pita Chips, the Grilled Shrimp and Chorizo Skewers with Piquillo Gazpacho, and the Sangria Spritzer Cocktail. And I don't know if Rachael hired a new stylist (or hair stylist) but she looked outstanding on this episode! I'm looking for a video where Rachael says her famous line, "I know!" She doesn't say it anymore!!!! Anony - you should check out youtube.com. It's the best source for RR video, but I wouldn't know how to find her saying that exact line! I think she needs to keep her cooking show. Her talk show is awful. Yum-O and Oh my gravy are getting really old! Don't worry, Anony. She just signed a deal with the Food Network through 2010, so there will be many more episodes of 30-Minute Meals for you to enjoy!